OS X Mavericks’ file sharing enables you to use files, folders, and disks from other Macs on a network — including the Internet — as easily as though they were on your own local hard drive. If you have more than one computer, file sharing is a blessing. Network: A network is two or more Macs connected by Ethernet cables, wireless networking (Apple refers to this as AirPort or Wi-Fi), or FireWire cables (rarely seen anymore). Ethernet: A network protocol and cabling scheme that lets you connect two or more computers so they can share files, disks, printers, or whatever. Ethernet ports: Where you plug an Ethernet cable into your Mac. Be careful to match the cable to its specific jack. On your Mac and printer, the Ethernet ports look a lot like phone jacks, and the connectors on each end of an Ethernet cable look a lot like phone cable connectors. But they aren’t the same. Ethernet cables are typically thicker, and the connectors (RJ-45 connectors) are a bit larger than the RJ-11 connectors that you use with telephones. Standard phone cables fit (very loosely) into Ethernet ports, but you shouldn’t try that, either; they’ll probably fall out with the slightest vibration. It’s unlikely that such a mistake will cause damage, but it won’t work and will be frustrating. Local devices: Devices connected directly to your computers, such as hard or optical drives. Your internal hard drive, for example, is a local device. Remote devices: Devices you access (share) over the network. The hard drive of a computer in the next room, for example, is a remote device. Protocols: Kinds of languages that networks speak. When you read or hear about networks, you’re likely to hear the words AppleTalk, EtherTalk (or Ethernet), SMB, and TCP/IP bandied about with great regularity. These are all protocols. Macs can speak several different protocols, but every device (Mac or printer) on a network needs to speak the same protocol at the same time to communicate. Support for the TCP/IP protocol is built into every Mac, and OS X Mavericks includes all the software you need to set up a TCP/IP network; the hardware you provide consists of Ethernet cables and a hub (if you have more than two computers) or an AirPort or other Wi-Fi base station. In addition to providing wireless networking, the AirPort Extreme wireless Base Stations — as well as the Time Capsule device — are all members of the router class of devices. The Time Capsule is a pretty cool deal; it combines a wireless Base Station, three-port Ethernet router, and a big hard disk that can be shared by all computers on the network and also used as a Time Machine backup disk. 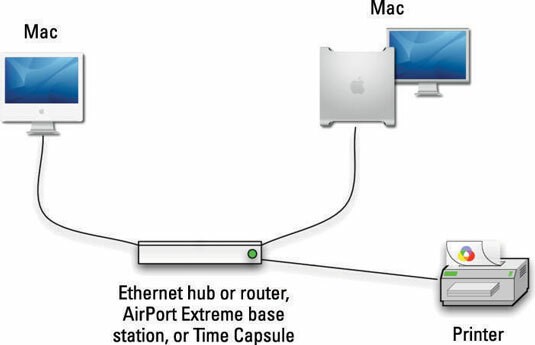 A typical Mac home-office network consists of two Macintoshes, an AirPort Extreme wireless Base Station (or other type of Ethernet hub or router), and a network printer. Below is the configuration of a simple network. The black lines between the devices are Ethernet cables; the rectangular device with those cables going into it is an Ethernet hub, router, AirPort Extreme Base Station, or Time Capsule. You need enough Ethernet cable to run among all your devices. Perhaps all you want to do is share an occasional file (not necessarily a printer or a home Internet connection or a folder of music files or pictures). In that case, check out AirDrop (for Lion, Mountain Lion, and Mavericks only on Macs built in the past couple of years), which uses Apple’s proprietary zero-configuration network protocol, known as Bonjour (formerly Rendezvous). Here’s how it works: If two devices (and this includes all Macs running OS X Jaguar or later) speak Bonjour, you don’t have to do any configuration other than, possibly, turning on the sharing capability. Bonjour queries the other available networked devices to see what services they support and then configures the connections for you automatically. Sweet! It gets even better if you’re using Lion, Mountain Lion, or Mavericks’cause you can use the nifty sharing feature called AirDrop. It appears in your Finder window Sidebar and locates all other AirDrop-capable Macs and i-Devices on your local wireless network. The only caveat is that it’s Wi-Fi only. For AirDrop to work, you don’t need to turn on File Sharing or do anything else. Just click AirDrop in the Finder Sidebar, and you see AirDrop in the Finder window. 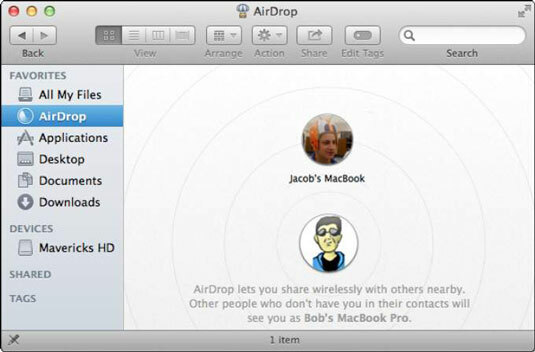 The key here is that both devices must be on the same Wi-Fi network and have an open Finder window with AirDrop selected in the sidebar as shown here. To send a file (or multiple files and/or folders) to the other Mac, just drag it onto the other Mac’s icon. AirDrop displays a dialog on the other Mac asking whether the user wants to accept delivery; if so, the items are transferred immediately to the Downloads folder. When you close the AirDrop window, you are no longer visible to other AirDrop users. With the simple network setup, either Mac can use the other Mac’s files, and both Macs can print to the same printer. If you have a broadband Internet connection, you can also connect the cable or DSL modem to the hub/switch/router so all Mac users on the network can share the Internet connection. A network can — and often does — have dozens or hundreds of users. Whether your network has 2 nodes (machines) or 2,000, the principles and techniques apply.